Note from Ryan: Use the table below to find the correct Flowmaster Super 40 configuration for your car or truck. Not sure which to choose? Follow links to check vehicle fit on Amazon. 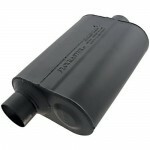 If you’re shopping around for some quality exhaust upgrades, why not go with a legend in the aftermarket world? 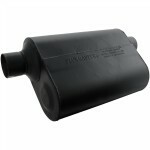 With thirty years in the business Flowmaster is definitely a company that’s done their homework. One of their hottest products, the Super 40 series muffler, offers a great balance between performance and great sound quality. 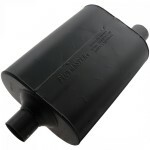 If you’re not quite ready to plunge into full exhaust work a muffler is a great way to start turning some heads. Constructed from aluminized steel this muffler weighs in at a mere 13.6 pounds and when we’re talking weight reduction, every little bit counts. The dimensions themselves measure roughly 20 by 10.5 inches with a thickness of 5.5 inches which is nothing out of the ordinary. The unique delta flow baffle setup produces a low, rich and throaty tone. If you’re a proud owner of some old school muscle, this is something you’ll appreciate every time you fire her up. The Super 40 is designed for trucks and domestic vehicles but Flowmaster makes sure to cater to most vehicles with both vehicle specific and universal kits. 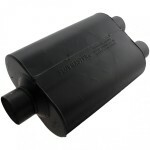 Head over to their main site, they will more than likely have a muffler for whatever you’re driving. What about performance? 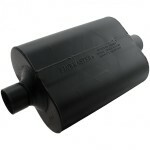 Flowmaster’s delta design takes advantage of what is known to the auto world as the scavenging effect. 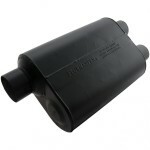 Take a look inside the muffler and you would see baffles arranged in a triangular fashion much like the Greek symbol. This design allows the usual noise reduction while at the same time creating areas of low pressure thus making the air travel faster throughout the entire system. 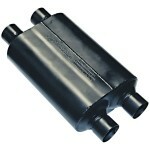 And don’t worry about blowing any packing materials out the tailpipe, it is non-existent in the Super 40 series. So what do we get when we speed up the airflow and reduce air resistance? You guessed it, horsepower! 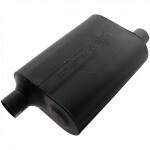 And if that wasn’t enough all aluminized mufflers are backed by a 3 year warranty against any defect in the workmanship. 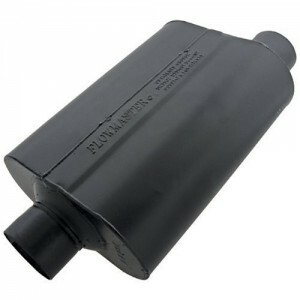 The Flowmaster 953047 has many satisfied customers, the majority of them breathing new life into their trucks. Enthusiasts are able to utilize track performance on the streets with great value and at under a hundred bucks, you can’t argue with that.